Lactose intolerance is often confused with milk allergy, but they are not the same. Lactose intolerance is the inability to digest dairy products and is now one of the most common physical conditions affecting humankind. Humans cannot absorb lactose for use as a calorie source unless they can first break it down into its monosaccharide component sugars: glucose and galactose. This is achieved through the intervention of lactase, an enzyme needed to break down lactose. As most people age, their ability to produce lactase decreases. Sometimes it decreases to the point where you are unable to deal with all of the lactose that you ingest. Lactose intolerance is hereditary and may be passed from generation to generation without affecting anyone but you. Between 30 and 50 million Americans are lactose intolerant and certain ethnic and racial populations are more affected than others. Lactose intolerance symptoms may be mild or severe depending on the degree of lactase deficiency and the amount of lactose sugar consumed. Symptoms of lactose intolerance may start within 15 minutes but they may also initiate after an hour, the classical symptoms are abdominal bloating, cramping pain and flatulence. No treatment can improve the body’s ability to produce lactase, but symptoms of lactose intolerance can be controlled through diet. The level of dietary control needed with lactose intolerance depends on how much lactose a person’s body can handle. Milk and other dairy products are a major source of nutrients in the American diet. 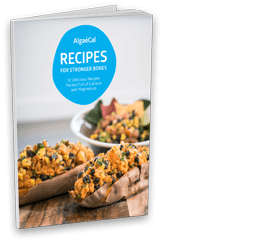 One of the most important of these nutrients is calcium. A concern for both children and adults with lactose intolerance is getting enough calcium in a diet that includes little or no dairy products. To find how much calcium you need to maintain good health and to see how much calcium you are getting from your diet, please use our Bone Health Calculator. If you are not maintaining the recommended calcium in your diet you may need calcium supplementation. 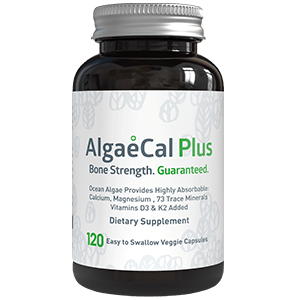 Learn more about AlgaeCal Calcium Supplement.